Having been asked frequently for full Military Specification parachute cord, we are proud to offer this cord which is made in the United States to the stringent MIL-C-5040 type III standard for nylon braided cord. Tested to a minimum tensile strength of 550 lbs, these 1000 foot continuous reels are available in Black or natural colour (White) and contain 7 internal strands of 3 cords each plus a smaller 2 cord colour coded fine strand. 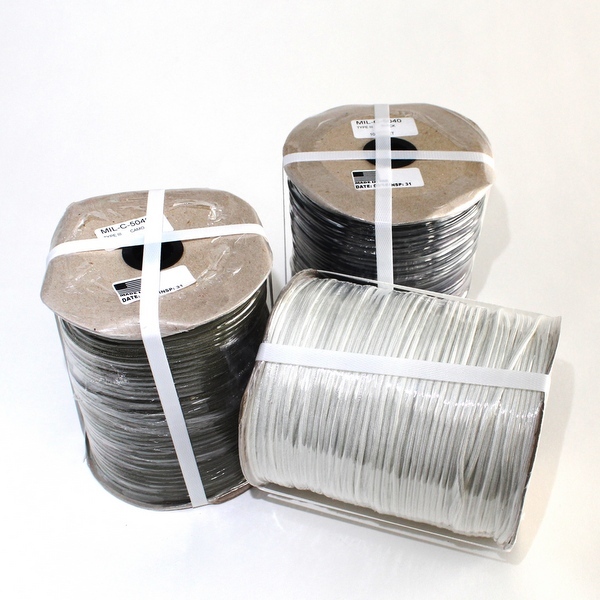 Strands can be removed to provide smaller diameter cords and threads for delicate repairs or survival tasks.